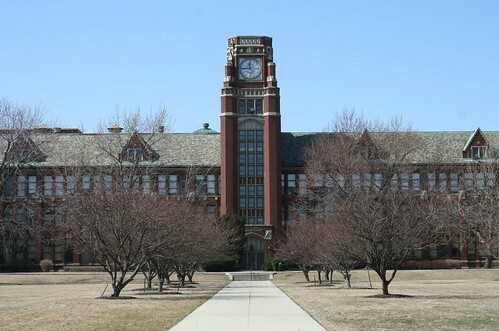 Lane Technical College Prep High School (architect John C. Christensen) is a Gothic icon on Western Avenue, a break from the relentlessly dense and unplanned commercial onslaught that lines Chicago’s longest street. 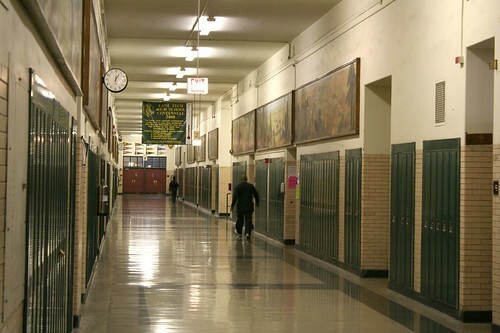 Lane Tech occupies a full city block (or more); the building is beautifully and artfully planned, with enormous spacious grounds surrounding an equally enormous building complex. 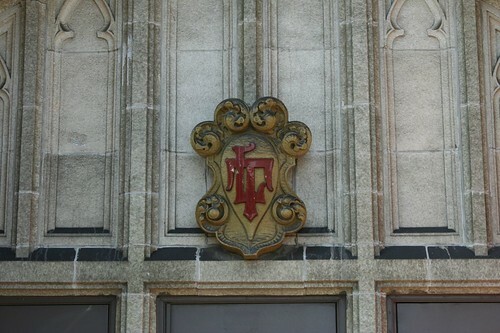 Founded as Albert G. Lane Technical School in 1908, it is the city’s largest high school, housing over 4,000 students. You would never guess at a glance that this building was finished in 1934. The red brick Gothic style was highly out of favor by that point, both from an artistic and economic standpoint, but apparently it was decided to press onwards rather than redo drawings that had been completed several years prior. The result was a building that was out of style before it was even built – but still remains highly impressive today. 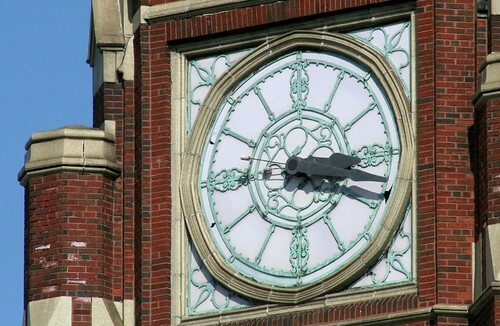 You could be forgiven for thinking that the prominent clock tower on the Western Avenue side marks the front of the school, but it doesn’t – a look at the building’s floor plan shows that the school is actually oriented to the north. 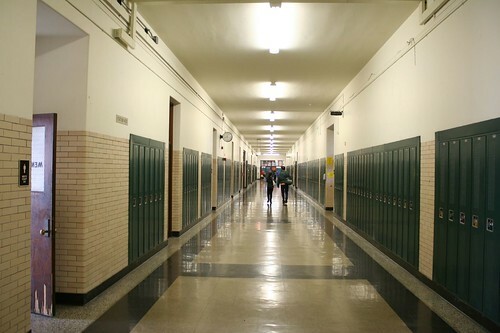 Inside the tower is one of the school’s many stairwells. The clock itself no longer functions. 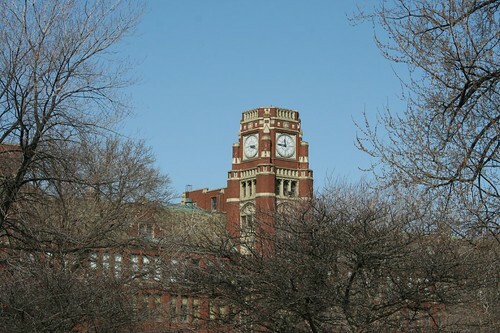 On the north side, facing Addison Street, twin towers demarcate the school’s primary facade. Between them is nestled the library, a beautiful double-height space with vast north-facing windows that bathe the space in indirect light. The school’s corridors are overwhelmingly long and monotonous, begging the question of how students manage to get from one class to another in the paltry 4 minutes they are alloted. Though monotonous and monochrome, the hallways are enlivened in a most unusual way. A series of 40 murals, created for the 1933 Century of Progress world’s fair, commemorating the contributions of every state in the union to modern technology. 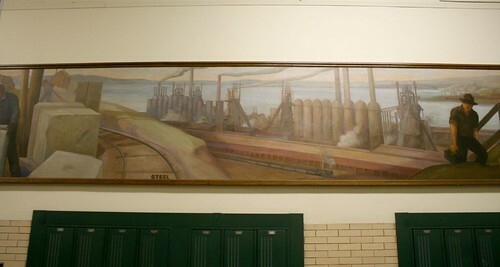 The attitude toward industry and manufacturing in these paintings is startlingly divorced from that of today. Whereas we see factories and refineries as eyesores to be minimized and avoided, these paintings celebrate them as welcome additions to even the most bucolic of landscapes. A steel mill alongside a lake is a thing to be celebrated, not mourned. It’s a fitting attitude for a building whose scale is that of a factory, an industrial-sized seat of learning. Lane’s early history is literally written on its walls. In the cafeteria, a small metal plaque notes that the sound system was the gift of the class of ’59. 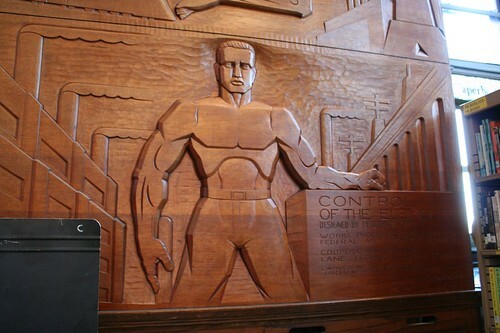 Art projects dating back to the 1930s are scattered around the building, including murals in the cafeteria and library, and bas reliefs carved in wood in the library. 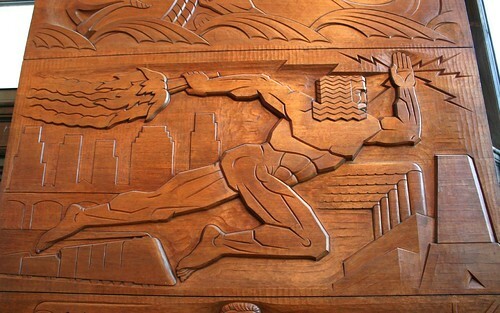 The wood reliefs were carefully restored just a few years ago. 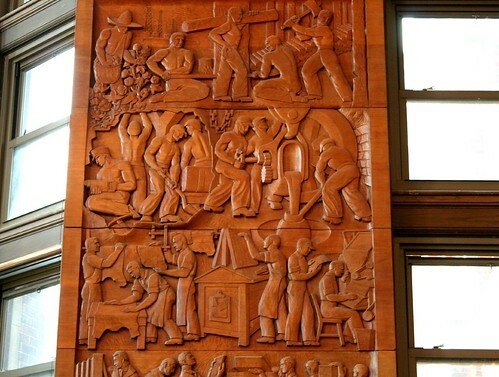 One, entitled Evolution of the Book, is in a WPA-influenced style similar to the Century of Progress murals. The other, Control of the Elements by Peterpaul Ott, is pure Art Deco – stylized, geometric, streamlined, and utterly amazing. Both were designed by teachers and executed with the help of students. 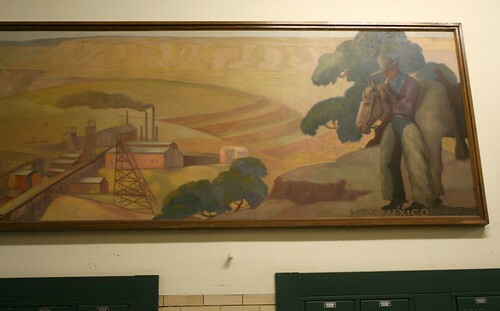 One of the nearby murals was done by members of the 1942 Mural Club. Even the utilitarian courtyards are artfully decorated, and used to engender school spirit. Both the librarian and a security worker I spoke to had glowing praise for the student body – hard workers, disciplined, well behaved, smart. Many are the children of immigrants. A handful were in the library studying on a beautiful Saturday morning. This entry was posted in Chicago neighborhoods, Period Revival Styles. Bookmark the permalink. Thank you for that post! 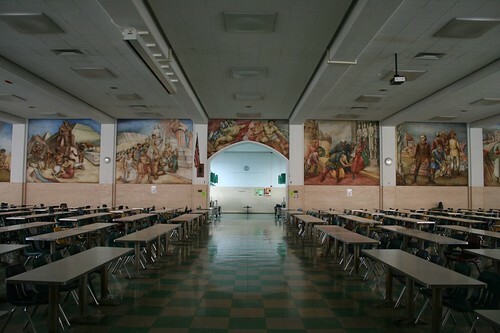 I've driven by Lane Tech a million times, but never imagined the interiors were so stunning. That library! To see the real Chicago take a tour of Robeson or Crane. Ha ha! 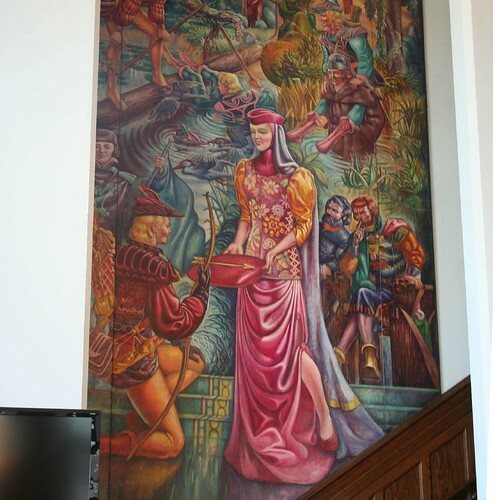 As an alum I can tell you that we were rarely allowed in that beautiful library. 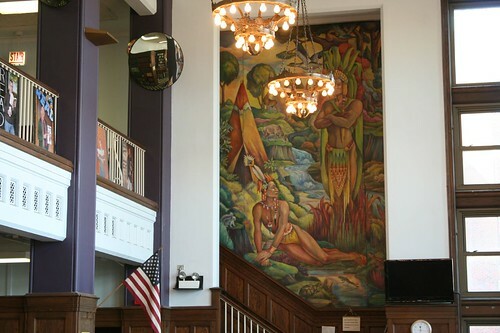 The rest of the interior was pretty ugly, with the exception of those cool murals. 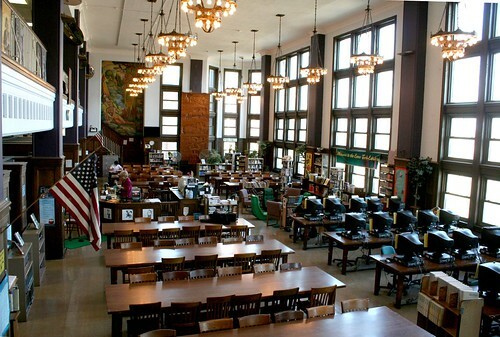 The library is open every day after school to any student and many take advantage of this while waiting for their various sports practice or other after school activities. Wonderful and top of the line school, remarkable history, great students. Thank you for the nice pictures. 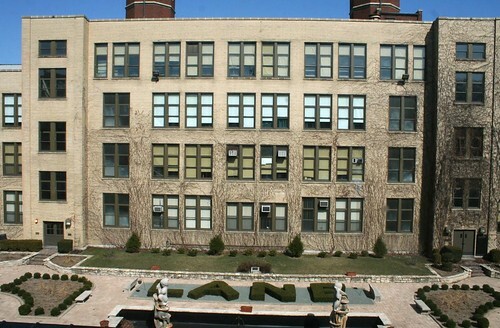 I love and miss Lane Tech! I'm surprised you did not include a photo of the Lane Tech stadium which lies adjacent to the west. "Wherever you go, whatever you do, remember the honor of Lane!" Every time I drive by that place, I stare at it, wonder about it and think, "I hope Chicago Sojourn does a post about it." So thanks!! 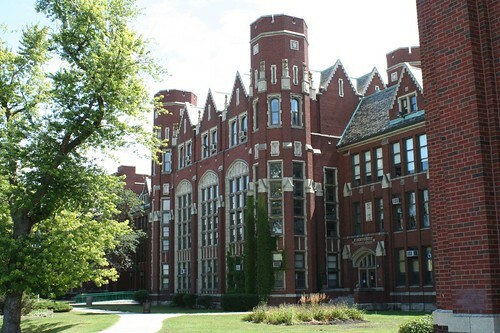 I hope you'll consider a tour of Evanston Township High School, which has a castle-like building similar to Lane's. It probably has all kinds of other great features I missed while I was a student. 89' grad… thanks for sharing! Staggering beautiful interiors. Utilitarian and artful. Chicago at it's finest, I think. I played TAPS in the garden when John Kennedy was shot. 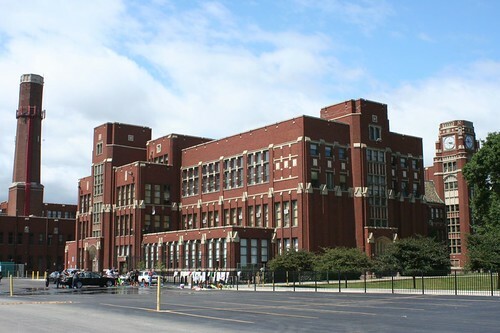 Robert,Great job on Lane Tech.Your excellent photos bring back memories of how beautiful the place was that I couldn't record "on film" at the time.Plus, very informative details I didn't even know.Thanks. The only thing I would add is that the Addison & Western campus is not the original building, the first campus was indeed founded in 1908, but at Division and Sedgwick. Beautiful photos, you truly captured the essence of Lane. Very nice. I went to Lane in the late 70's. Back then the garden was really overrun at that time. One of the teacher tried to get it cleaned up, but it was too big a task. It is really nice to see it has finally been cleaned. Of all of my choices in life, going to Lane was the best decision I made. I still think back fondly on those years. Thanks for posting. Some great photos. Brought back many happy memories. Michael, Class of 1968. My two sons attend there now (junior and freshmen)and i tell them almost everytime i drop them off how lucky they are to attend ..a school i only dreamed of attending. "make the best of this opportunity at Lane Tech" We are proud parents. they are also both Lane Tech swimmers..Go Indians! LTHS Class of 1980. Great article! Beautiful post! Really captured the essence of the school. Thanks for allowing me to reminisce on all of the great times spent inside and outside of these walls. Shoutout to the class of 2011!